Berlin is the capital of Germany and one of its 16 states. With a population of approximately 3.5 million people, it is the second most populous city in the European Union. 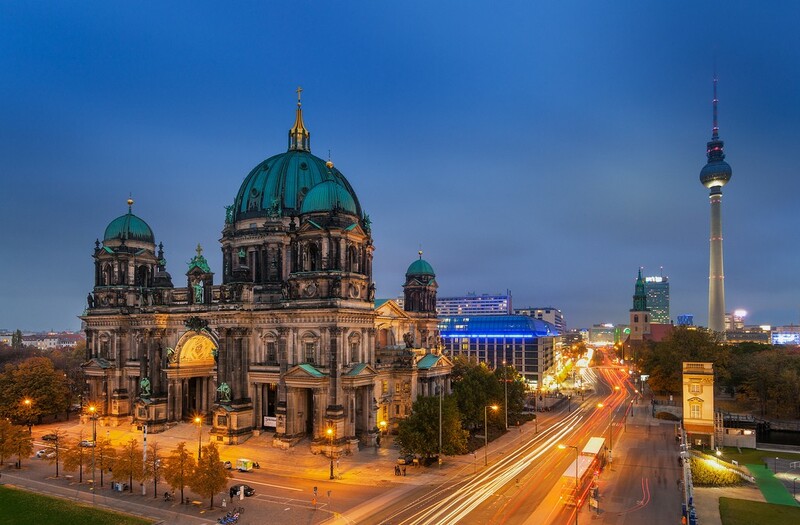 First documented in the 13th century and situated at the crossing of two important historic trade routes, Berlin has remained the capital of successive empires that ruled the region from 1417 onwards. After World War II, the city was divided; East Berlin became the capital of East Germany while West Berlin became a de facto West German exclave, surrounded by the Berlin Wall (1961–1989) and East Germany territory. Following German reunification in 1990, Berlin was once again designated as the capital of united Germany. Berlin is a melting pot of nationalities and cultures and has thriving Muslim and Jewish communities. A majority of the approximately 40,000 Jews now residing in Berlin have come from the former Soviet Union (now Russia). Additionally, Berlin is considered to contain one of the fastest growing Jewish communities in the world due to Russian, Israeli and German Jewish immigrants, whose ancestors fled Germany during World War II. And this upsurge in the Jewish population has also spurred tourism to an array of monuments, synagogues, museums and workaday places related to Jewish history and present life in Germany’s capital. Of the approximately 160,000 Muslim foreigners in Berlin, about 73% are of Turkish background, 7% from Bosnia-Herzegovina, and 4% are from Lebanon. The total foreign population of Berlin is estimated at 466,518. In addition to these numbers, it is assumed that there are at least 40,000 Muslims in the city who are naturalized German citizens. The size of the Muslim population in Berlin stands at approximately 9% of the city’s total population. This committee covered different modules of conflict transformation methods and tools in the interfaith context. With a good understanding of conflict and ways of addressing it, the group shared best practices and developed recommendations for community engagement in the areas where participants are actively involved. The committee aimed to empower participants to talk to one another and learn about each other’s religions, cultures, and mindsets with regard to gender and related issues that play a key role in our daily lives. Participants also set out to deconstruct definitions that limit such conversations, including the recognition of a plurality of opinions within each of our religious traditions. The committee explored cultural and religious minority identities and the situation of these minorities within the society, from both personal and societal perspectives. In the process, participants developed deeper understandings of the perspectives of cultural and religious minorities, as well as of the majority society, and helped one another understand these different perspectives through an empathetic lens. The committee investigated traditional and modern artistic expression in Islam and Judaism; explored how stories express the intersection of culture and religion through music, theater, and visual media; and assessed the power of those stories in social and political contexts. The committee explored how anti-Semitism, Islamophobia and hate speech impact one’s identity, life, and point of view toward the “other”; identified the stereotypes and prejudices behind ‘othering’; discussed the role of the media in framing current events; and introduced alternative lenses and innovative ways to view and combat these global problems. The methodology of the committee included a mixture of training techniques (small and large group discussions, role playing, simulations, lectures, case studies, etc.) designed to inform, demonstrate, and enhance learning. This committee gathered experienced, and new social change makers from diverse backgrounds with an interest in delivering their work to reflect interfaith, and inter-cultural contexts. This committee provided a unique opportunity for those dedicated to value driven social change to step away from the day-to-day challenges, and in a safe space; reflect on their leadership, build new networks, learn from peers, and gain expert skills.